Can I become a jobber? How do I become a jobber? What does the appJobber cost? Is it legal to do these jobs? In which countries can jobs be completed? Which types of jobs exist? Where can I find normal jobs? Where can I find scouting jobs? What’s the meaning of the star on the job icon? What is the meaning of the different colours of the job pins? Why do I have to take and upload photos of my driving licence for specific jobs? Do I have to upload photos of my driving licence to use appJobber? I am of age and want to be able to work on any job but I do not have a driving licence. What can I do? What do I have to do as a jobber? How does the excecution of a job usually look? How does the reservation of a job work? What happens when my reservation period has expired? How am I supposed to act in retail outlets? Should I state that I’m in the store on behalf of appJobber? I was forbidden to take photos – what should I do now? How do I behave properly in road traffic? Can I complete jobs while driving? Am I supposed to complete dangerous jobs as well? Why are there even dangerous or impossible jobs available? How do I report a job? How do I change a photo which I have taken? I cannot reach a certain waypoint – what should I do? How can I make sure that I have completed every task? How can I comment on a job? Why am I being asked to correct the position/ angle of my photo and how can I do that? Do I have to upload my results right away? What happens after I have completed my job? How long does it take to check my results? My result has still not been checked after 4 weeks – why is that? What happens after the result has been checked? Can I correct a result? Can I oppose the rejection of my result? Where can I see the status of my results? How much money do I receive per Job? When can I request a payout? How long does it take for my money to be transferred? I have been waiting for my money for a while now – what happened? I requested a payout but shortly afterwards I noticed that some of my personal and/or account data is wrong. Do I still have to wait now? Do I have to tax my earnings from appJobber? What are email job alerts and how do they work? What are push job alerts and how do they work? My app has technical problems, what should I do? My question has not been answered! My question has not been answered. What do the different colours of the markers mean? Why was I prompted to correct the picture location? I can't reach a waypoint. What now? Can I change my picture? Do I have to upload my job immediately? How do on-site jobalerts work? How much strain does this put on my battery? AppJobber is a crowd-sourcing platform that collects commercial data fast and cost-effective. Customers ask our users to do certain micro-jobbing tasks e.g. to check the placement of their products at stores or to find out if merchandising is placed in compliance with the guidelines. In return, the so-called jobbers (aka the users of the appJobber app) have the possibility to easily earn money by executing small jobs on their smartphones. To become one of our customers please contact us via email at sales@appjobber.de or per phone +40 6151 62915 10. We will be happy to assist you. Jobbers have to be of age and own a functional Android- or iOS smartphone. There are no further requirements. 1. Download the app via GooglePlay or the App Store. 2. Use the app or our website www.appjobber.de to register with a valid email address. Confirm the registration afterwards. 3. Accept and complete jobs. Downloading and using the appJobber app ist completely free. Jobbers receive the full reward stated in the job description. Attention: PayPal charges a fee with every payout. Please direct further questions directly to Paypal. A bank transfer is not subject to any additional fees. Customers receive a fully customised offer for their commission of jobs that varies depending on complexity and size of the project. Ask us now about an unbinding offer via sales@appjobber.de. Yes, we will never offer any illegal jobs or tasks. If a job seems suspicious it can be reported. Jobs are available all over Europe. The map shows all available jobs in your proximity. By moving the map you can search other cities/ regions for jobs. Another possibility is using the search function to look for a city. Important: Jobs can only be seen and completed in countries that use the same currency as the country of residence stated in your account. Example: An account that’s registered in Germany can complete jobs in Germany, Austria or Spain but not in the UK or Denmark. Exception: Switzerland is an exception. There, jobs are also offered in euros and can therefore be completed by users from Germany, Austria, France, Italy etc. You can request a new password via https://appjobber.com/login/request_password at any time. Attention: Should you have requested to not receive any emails from us, you will also not receive an email with your new password. In this case you will have to send us a mail to support@appjobber.de giving us permission to send you emails again. Notification preferences can be changed by logging in on www.appjobber.de, opening the menu “notifications” and adding or deleting the check marks to your liking. You can always delete your account via “delete account” on your profile page on www.appjobber.de. Attention: We may request a further confirmation of the deletion via email if there is money left on your account or if there are any other unresolved matters. Notice: We will miss you! Normal jobs usually revolve around taking photos of certain objects at fixed coordinates. Occasionally you will have to answer some additional questions or visit certain waypoints. You can see normal jobs as pins on your map. Scouting jobs do not, unlike normal jobs, have fixed coordinates and are therefore not bound to a certain location. Instead they can be completed either from home (surveys) or by collecting relevant information about a specified area. 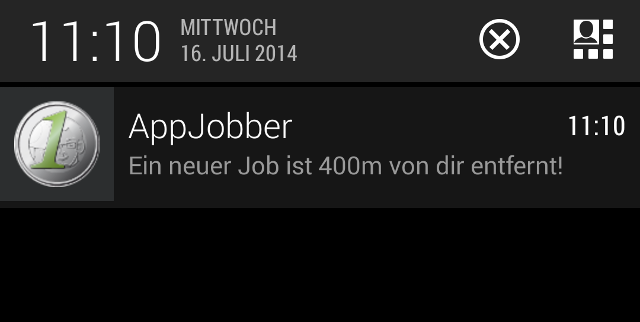 There are two ways to find normal jobs in the appJobber app (download for free via GooglePlay or the AppStore). 1. After opening the app you can see jobs in your proximity as pins on the map. Move and refresh the map to look for jobs available in different areas. 2. By clicking on the list symbol you can see all available jobs in your area displayed as a list. Hint: To receive instant notifications about the availability of new jobs we recommend subscribing to our newsletter and to our email and push job alerts. Android: By changing the tab to “scouting jobs” you can see all scouting jobs that are available right now. iOS: By clicking on the looking glass symbol in the top right corner you can see the available scouting jobs. A star indicates that this job is new and could therefore be especially interesting for you. The colour of the markers (or pins) depends on the value of the job’s reward and is supposed to give you an easy overview about especially rewarding jobs. 1€ jobs are presented in green. 2€ jobs are presented in blue. 3-4€ jobs are presented in purple. 5-9€ jobs are presented in orange. 10€+ jobs are presented in red. Some jobs can only be completed when you are of age. For this we need an age verification. Since we are not legally allowed to ask for pictures of your ID card, we have to fall back on your driving licence. However, every valid photo ID is acceptable. No, you can use the appJobber without uploading any sort of photo ID. However, some jobs will not be available without an age verification. You can upload any other valid photo ID as long as name and age are clearly visible. Usually, it is the jobber's task to collect information related to specific locations. This can be done in different specific ways e.g. by taking photos, writing descriptions, sending GPS positions or visiting waypoints. After clicking on the pin on your map a short description of the job will be shown. By clicking on “help” or “instruction” this description will be expanded. The tab “tasks” shows which tasks have to be completed for this job while the tab “map” shows which waypoints have to be visited. By clicking on the button “Accept Job”, the job is usually reserved for 3 hours and cannot be done by any other Jobber during this time. After completing all tasks (see question 2.13) the job can be uploaded. Jobs can be cancelled at any time in the menu in the top right corner. A job can be reserved by choosing the button “Accept Job”. For most jobs, the reservation time is 3 hours. During this time, the job cannot be completed by any other jobber. The section below the reward shows you when your reservation expires. In some cases – e.g. if a job is very extensive – the reservation time can be longer than 3 hours. If you do not want to complete a job that you have reserved, you can cancel the reservation at any time. If you open “job details” you have to click on the three dots in the upper right corner or click on the square with the arrow pointing upwards and click on “Delete Job”. Alternatively, you can delete this job in the settings under “My jobs”. When the reservation time has expired, you can reserve the same job again. This can be done a maximum of three times in a row. After that, there is a 24-hour blocking period. During this time, you will not be able to access the corresponding job. This feature prevents jobs from being reserved for days on end and thus blocked for other jobbers, even if the jobs are not completed. If you still complete the job after the deadline, you can upload it “under reserve”. However, this means that we can only accept your results, if all requirements are met and the job has not been completed by another jobber during the regular reservation period. A lot of jobs revolve around mystery shopping or mystery checking. For these tasks it is important to our customer that the staff does not notice that certain things are being checked. In this case it is preferable if you take the photos discreetly. On the contrary, some jobs require an introduction to the store employees. For this you can usually download a permit in the job description. If the employees have further inquiries, you can direct them to us by giving them our email address or our phone number. Should a staff member approach you or should it be stated in the job description that you have to report to the store manager before executing your job, you may explain that you are there on behalf of the crowdsourcing platform appJobber. If there are further inquiries you can give our address to the person on site. While it is legal to take photos without the intention to publish them, some stores have specific house rules. Signs or personnel stating that taking photos is not allowed must be respected. In this case you can upload the result and comment accordingly. Always be aware of your surroundings and pay attention so that you don’t endanger others or yourself. Never disturb the road traffic. It can therefore be necessary and recommendable to be patient and wait until road traffic has subsided. If a job is impossible to complete because of street layout, report this job via the app (see question 3.10). For more information please consider questions 3.8 and 3.9. Please don’t use the appJobber app while driving so you can pay full attention to the road. The safety of our jobbers is one of our top priorities. Furthermore innocent people could be involved in an accident caused by you. We do not accept photos taken inside of your car and will reject any of these results. No!! If a job is too dangerous or even impossible you can report it via the menu (see question 3.10). Please never put yourself in danger or perform illegal acts because of appJobber. Due to the big amount of jobs it is impossible for us to check every position on the map for dangers and impossibility. That is why it is possible for a pin to be placed on private property or on a highway. This is not intentional and we are thankful to get reports that support us in finding and deleting these jobs. Thank you for your help. A dangerous or impossible job can be reported in the menu via “report job”. Thank you for your help in protecting other jobbers from danger. By clicking on the photo in the task tab you can delete or edit the photo. You can also correct your location and your visual angle. If a waypoint is impossible to reach or only reachable by putting yourself in danger, you can still complete the job without visiting it. Just click the pin on your map and confirm the inaccessibility. By taking a look at your GPS data we can deduct if you have tried to physically reach the waypoint. Afterwards we may still accept your result. After accepting a job you can see all necessary steps in the job description in the tab “tasks”. After having completed a step it will be highlighted in green. It is only after every step has been marked green that you can be sure that every task has been completed. Most jobs offer the possibility to add comments in a separate task. Your comments will be considered when checking your result. A second option would be to add a comment online via www.appjobber.com. Choose the result view and click on “add comment”. In order to prevent GPS deviations, you will be prompted to correct your location manually. To do so, move the hair cross to your position on the map, and confirm by choosing "set location". Furthermore, it is important to correct the viewing direction from which the picture was taken, because this information is important for data evaluation. You can save results on your phone and upload them at a later time (e.g. when you have a better internet connection). Attention: Usually, a job is only reserved for 3 hours after you’ve accepted it. If another jobber uploads their correct result after this time has passed, they will get the reward. After completion and upload of your result we will store it in our databank. We will then check your result in the following weeks. Checking your results usually takes only a few days but never longer than 4 weeks. The results of some jobs are not checked by us. Instead the customer itself checks all results. Because of this we sometimes do not have any influence on how fast a result is being checked. We thank you for your patience and understanding. You can message us about any delays via email and we will try to solve the problem. If your result has been accepted, we will credit the reward to your appJobber account. A result will be rejected if it does not meet the requirements as stated in the description. Depending on how much your result differs from our expectations we may give you a chance to edit your results within a certain timeframe. You will be notified about this per email. Attention: The chance to edit your results may only be available for one day so be sure to check your emails regularly. Yes, this is possible within 2 weeks. Just click on the objection link in your rejection mail. Your result will then be checked again with consideration of the comment in your objection. Either after logging into the app or directly on our website www.appjobber.de. Just just select the menu item “my jobs”. The reward varies depending on complexity of the job but it is always at least 1€. You can see the reward for the respective job in the pin or the description. The reward is determined by our customers and will be transferred to you without any additional fees. Attention: PayPal will deduct the usual fee if you choose a payout via PayPal. You can always request a transfer of your money regardless of the collected amount. However, this requires your profile to be complete. Click on the payout button in the “my account” menu item on https://appjobber.com/jobber/account to request a payout of the sum collected in your account. On Android systems you can also request a payout by clicking on the piggybank. We are trying to guarantee that payments are made by the beginning of the following week. It is, however, possible that payments are delayed for a couple of days. Attention: Consider that the bank needs a few additional days to process our transfer. Please be patient as we have no influence here. It is likely that there has been a problem during the money transfer process. This could be caused by different things e.g. wrong account data. We will then message you via email and request a correction of your data. After your correction we will try to transfer your money once more. Hint: To avoid delays it is recommended to check and correct your account data regularly. Sometimes it is possible to make changes in a credit transfer retrospectively. Send us an email to support@appjobber.de including your corrected data and we will try our best to fix the problem. Hint: We cannot guarantee that the money transfer can be corrected before we process the payouts so depending on your payout method you may still have to wait for a while. However, the sooner you tell us about the mistakes the higher the chance that we are able to fix it in time. For legal reasons, we are not allowed to disclose any information about tax regulations. If you have any questions regarding taxes you have to direct these to a tax consultant. We offer the payout of the job reward via transfer to bank account or PayPal. Which payment option is prefered can be chosen before every payout. Bitte beachten: PayPal berechnet für jede Transaktion Auszahlungsgebühren. Seit 31.8.2018 gilt folgende Gebührenordnung: Für Umsätze bis 2.000 € fallen 2,49% an. Dazu kommt eine zusätzliche Festgebühr von 0,35 €, die bei jeder einzelnen Überweisung abgezogen wird. For those, who do not want to pay fees, we recommend the bank transfer. Who wants to stay with PayPal despite the fees, we give you this piece of advise: Wait until you accumulated a larger amount and request it then. 2,49% will be charged nontheless, but you only have to pay the fixed fee of 0,35€ once. To get job alerts you have to subscribe to regions. If a new job becomes available in this region, subscribers of this region will be notified about it via email once a day. To unsubscribe from a region, go to the menu and keep your finger on the respective region, pressing firmly, until you see a garbage can in the upper right corner. You can then use this symbol to delete the respective region from your subscriptions. Push job alerts are push notifications that will be displayed directly on your smartphone if you are close to a job. This makes searching for a job as easy as possible since you can no longer miss any jobs in your proximity. You can deactivate them in the menu under “options”. By activating both push job alerts and email job alerts for one region it is possible that we suggest especially attractive jobs to you even if you are not in their proximity. This increases your chances to complete attractive jobs first. 1. Close the app and open it again. Notice: This does not mean returning to your home screen. The app must be closed properly. 2. Log out and log in again. 4. Uninstall the app and install it again. 5. Remove your sim card and insert it again. - specification which appjobber version is being used (this information is available in the according app store or in the app itself in the menu item "about us"). Please contact us via support@appjobber.de. We will be happy to assisst you. Hint: Please read the FAQs carefully before you contact our support. This reduces the amount of work and allows the support to work on more complicated issues or questions. On the map you see jobs in different colours. Jobs with a reward of 1€ are displayed in green. Jobs with a reward of up to 4€ are displayed in blue and jobs with a reward of up to 9€ are displayed in orange. Jobs that are worth 10€ or more are displayed in red. This way you can instantly see where the best jobs are located. To prevent GPS deviations, you will be prompted to correct your location manually. To do so, move the cross hairs to your position on the map, and confirm it under "Set location". Furthermore, it is important to correct the viewing direction in which the picture was taken, because this is used to evaluate the information. If you can't check off a waypoint because you would be putting yourself in danger by doing so, or because it simply isn't reachable, then you may still complete the job. Simply open the options menu and choose "waypoint not reachable". We will still check whether you were near the waypoint. If you want to report a dangerous or impracticable job, you can do that by going to the menu and naming a good reason. Please click on "Report job" so that the information will be sent to us to disable the Job. We appreciate your assistance to improve our internal processes and those of our clients. You can find the scouting jobs on the top toolbar. Therefore, all scouting jobs in your area will be shown as a list. If you click on the foto symbol you can edit your taken pictures. Here you have the option to "delete" or "edit" them. In the editing function you can change the position and view point in which the picture was taken. No, you can also save your response and upload it at a later time. However, you are only guaranteed to be able to work the job for 3 hours after starting it. After 3 hours the Job will be opened back up for other Jobbers to start. Unfortunately, if another Jobber uploads their response before you do, you may no longer upload your response. With the new on-site job alerts you will be informed automatically about new jobs in your proximity. As soon as you are in the immediate vicinity of a new job, you will receive a push notification to point the new job out to you. To keep you up to date about new jobs, your phone regularly checks where you are at and gives you feedback about jobs in your immediate surroundings. A long battery life is very important to us. Accordingly, we have designed the on-site jobalerts as energy-saving as possible. If you do not want your battery to be affected at all by this, you can disable the function. To do so go to the menu and select "on-site jobalerts" and disable the "on-site jobalerts" switch. If you cannot check off a waypoint because you would be putting yourself in danger or because it is simply not reachable, you can still complete the job. To do so select the tab " map " and click on the unattainable waypoint. Then, operate the info icon and change the waypoint to unattainable. If you want to report a job as dangerous or as impracticable, then,you can do so with a suitable reason via the "report job" button. We receive the information and lock the job. We thank you for your assistance in helping us improve our internal processes and those of our costumers. You can find scouting jobs on the top toolbar bar. By clicking on the button, scouting jobs in your area will be revealed. A scouting job can, for example, be reporting new restaurant or store openings in the area. You can cancel a job in the view in which you write your response. To do so, you need to choose the corresponding option in the menu bar (top right). No, you can also save your jobs and upload it at a later time. However, you are only guaranteed that you are exclusively working on the job for 3 hours after starting it. After 3 hours the Job will be reopened for other Jobbers to do. Unfortunately, if another Jobber uploads their response before you do, you may no longer upload your response. We use special features from apple that make it possible to limit the battery drain to approx. 1% per day.